East Timor’s Oil Resource: Boon or Bane? Some are concerned that the country is overly dependent on its oil and gas sector. Questions have emerged over the performance of East Timor’s Petroleum Fund, reviving discussion about whether the country is suffering from a “resource curse” caused by an over dependence on oil revenues. East Timor’s Central Bank published a report shows net cash inflows of $177 million for the fund in its most recent quarter, a modest figure which the Timor-Leste Central Bank said reflected “payments to the state budget.” However, local non-governmental organization Lao Hamutuk, which has been monitoring the growth of the Oil Fund since 2005, has insisted that it is more accurate to state that the total fund actually decreased, from $16.634 billion at the beginning of the quarter to $16.584 billion at the end of September. What’s the reason for the $50 million drop? Lao Hamutuk agreed with the Central Bank that the $340 million withdrawn from the fund to finance state projects accounted for the bulk of the decrease. But it added that the fund also suffered foreign exchange losses amounting to $276 million during the quarter. If that is accepted, then for the first time, East Timor’s income from oil and gas operations did not exceed the expenses related to the Oil Fund. Oil and gas accounts 95 percent of East Timor’s state revenues. 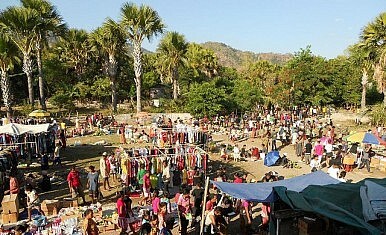 East Timor’s gross domestic product (GDP) was $4.5 billion in 2011, of which 77 percent was from the oil sector. Lao Hamutuk warned that this could be the start of a trend that would deplete the Oil Fund in a decade. Earlier, Charles Scheiner of the Australian National University wrote a brief about East Timor’s worrying dependence on its oil sector to prop up the domestic economy. The researcher also pointed out that East Timor’s agricultural and service sectors are not being developed properly. He questioned, for instance, why East Timor is importing so many consumer goods that it can produce locally. Scheiner reminded East Timor that oil might be providing the dollar revenues it needs today but that the country might suffer in the long run if non-oil sectors of the economy are not widely promoted. The government of East Timor has countered the “simplistic” assumptions of analysts who worry about the current dominance of the oil sector in sustaining the local economy. It issued a rejoinder in which it emphasized that the country’s non-oil economy actually grew at an average rate of 11.8 percent annually from 2008 to 2012. It also denied that the Oil Fund is being abused to subsidize state projects. “Withdraws from the petroleum fund are based on what is considered sustainable in the long term and not short term changes to oil revenues,” according to the paper released by the government last September. “Resource wealth in Timor-Leste has helped cement peace and has not caused political instability. The petroleum fund means the most severe forms of macroeconomic instability have been avoided. And most public spending has been in important areas like electricity, roads, education, health and social assistance and not on white elephant projects,” it added. Whether or not East Timor’s oil resource will be a boon or bane in the future, what is certain is the need to aggressively diversify the economy today by expanding the country’s non-oil sectors. East Timor’s authorities and their critics can surely agree on this point. Superficial rankings should not distract from the significant obstacles the country is yet to overcome. What’s Next for Timor-Leste’s Economy?One New Way to Boost Timor-Leste's EconomyTimor-Leste: The Challenges of Democracy and DevelopmentA New Era of Political Coalitions in Timor-Leste?What’s Next for Timor-Leste’s Greater Sunrise?